Let's face it - road tripping with little's is never easy, no matter how many dollar store hacks you find on Pinterest or how many shows you download off Netflix. Kids always have to pee, get car sick, spill their apple juice, and fight in the back seat. It happens. But here is what we do to get from A to B in one piece and somewhat maintain our mental state! As many of you know, I am a born and raised a Vancouverite so I like to travel back every summer to visit my family and close friends I grew up with and now all their littles, so this road trip is nothing new to us. However, as the years pass and the Chunks get bigger, our routines change a bit. Here are some things we are planning for this trip, and I hope this can give you a few ideas if you are taking a long road trip this Summer! First things first - we never start off with the Ipad/electronics. In our experience, this has never ended well, and this is something that is treated as a treat in our home and is earned with good behavior! 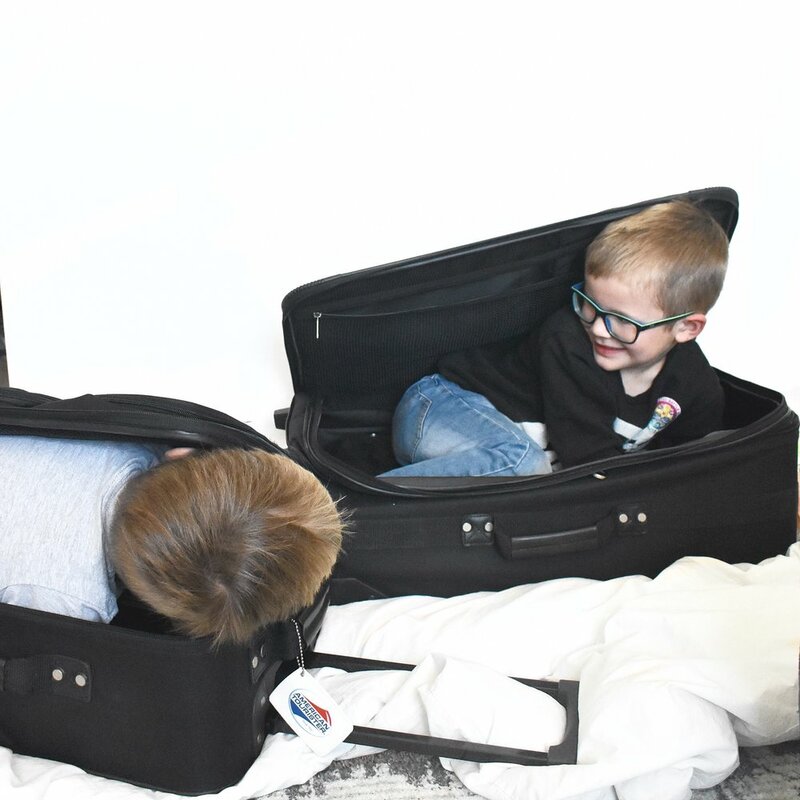 This gives the kids an extra incentive to stay cooperative for that much longer, and in a ten-hour road trip, any minute of peace is a good one. We always pack the kids plenty of books to read so we typically start off with an hour of reading and looking at books. Once two shows have been watched, out comes our first feed! If there is ANYTHING I have learned from multiple road trips with these two Chunks, we are usually OK as long as we have snacks and enough food. 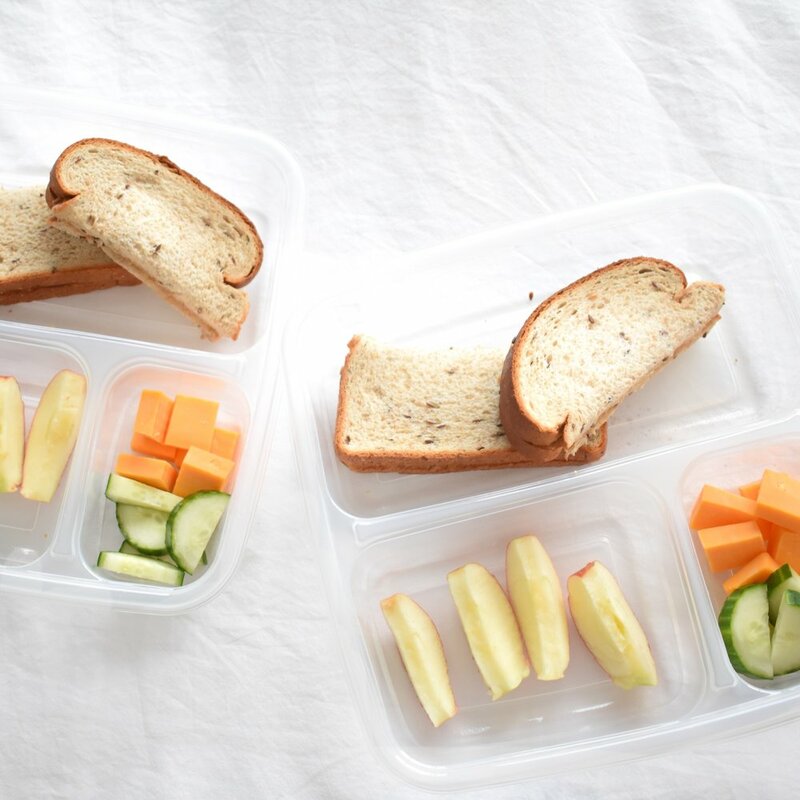 Typically we pack snacks such as fruit like apples and bananas that are easy to eat and clean up, as well as crackers, rice cakes, if we're going over lunchtime we pack sandwiches and things like cheese strings, cucumbers etc. really anything that can sit for a little bit without getting too gross. Our kids are pretty picky eaters, so instead of getting fast food two meals, we pack one and eat out for dinner, saving us money and giving us food that doesn't make us feel like absolute sludge while driving in a stuffy car for hours - ew. Last year we found THE PERFECT road trip accessory and it is a lap tray that goes over car seats! We found ours on sale I believe at Staples but I will link an example here - GAME CHANGER! Our boys love to colour and Jackson is currently huge into word searches, dot to dots and mazes so I go to the dollar store before the trip and stock up on a few workbooks which usually entertain them 1-2 hours of the trip! I pick up some sticker books or math books for Jackson as well for something different - again, every minute counts and he finds this kind of learning fun so, win-win! Being the navigator, garbage operator and janitor in the passengers' seat, there are a few items that are a must in order to remain sane in that front seat. I usually pack an extra few plastic bags for garbage and still will, but I discovered this hack that I will be trying out this year and that is taking a dry food container with a lid that half flips up and put a plastic bag in there and tada! A nice little garbage can you can close to keep out old food stink! Genius. Also in my "keeping sane up front" kit are wet wipes to clean up food hands, boogers and all else, hand sanitizer, tissues, extra plastic bags, paper towel, and BRIBES. Everything in this kit is necessary guys - especially the bribes. Not only are they incentive to have both boys keep their cool when things are close and intense, but it also rewards them for their amazing behavior which I love doing. It can be anything from a Kinder Surprise, small toy, a new activity that they think is a treat, a new book, whatever your kids are into! I would try to stay away from the sugary treats because, well, health and the fact that you’re giving your kids pure sugar while they are strapped in a seat for hours seems unwise, but to each their own. By this time we've usually made it to a city we stop in and stretch our legs, maybe hit up a park to let the kids run around for a few minutes because it means less energy and more peaceful drive for you... definitely worth losing that extra 10 minutes! Take those 10 minutes, even 20... you will thank me later. Another idea we're going to try this year is put a piece of tape across the top of the car with each city we have to go through to get to our destination and a car that sticks to it, so the boys can take turns moving the car to the next city when we've arrived there. This may make their trip a little easier being able to see what we have ahead and create a little excitement to move the special car. Kids, right? they're the best. Well, this is as creative as it gets when it comes to our road tripping survival, it has usually been a seamless trip except for Maddox's asthma episode last year, I will never forget Paul rushing Maddox to the hospital in the next closest city at midnight with him having difficulty breathing... lets just hope we don't have a repeat of that experience, shall we?